Bags like this were up to 2 feet long. Archaeologists believe the Basketmakers used the bags for storing and carrying food and other necessities. 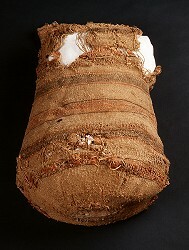 Some of the bags found in archaeological sites still contained residues of corn meal and other foods.